I received this audio book free with a code from the author. I haven't had a lot of success with audio books in the past. Whether through poor narration or lack of attention on my behalf, audio books just haven't worked for me. This audio book changes that. 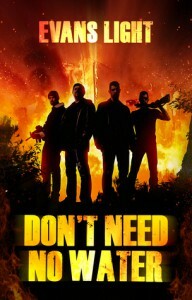 Don't Need No Water is a book about revenge... revenge most vicious. Sissy has been found dead in the local jail. It is believed to be a suicide after the sudden taking of her parents. Iverson doesn't believe Sissy killed herself, he thinks she was murdered. She was in love with life and he was in love with her. Her murder will be revenged... violently. The narrative breathes life into Don't Need No Water. The music was a very nice touch adding a soundtrack and a precursor to the scenes of violence. Iverson was really the only character given any depth. This is okay because it's a story about his revenge and the rest of the characters are supportive or just plain cannon fodder. The ending surprises and satisfies. It was a quick audio book clocking in at a little less than an hour. But a fun hour it is. I recommend this and if you like your revenge served piping hot, you can't go wrong with this one.